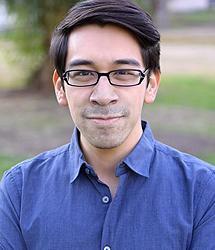 The Sociology Department is excited to share the news that Julian Rodriguez, 4th year student, has been selected to join the first cohort of the UC Santa Cruz Graduate Pedagogy Fellows Program. The UCSC Center for Innovations in Teaching and Learning will inaugurate the Graduate Pedagogy Fellows (GPF) program in Winter 2018 with 20 fellows from various academic departments on campus. The GPF is a new interdisciplinary professional development program for graduate students with the goal of having fellows deliver enhanced TA training to their departmental peers. As a Sociology Teaching Assistant, Julian was attracted to the GFP program “to further (his) knowledge of inclusive and compassionate teaching practices while continuing to lead and mentor in service of students.” As recommended and described by Sociology Professor Rebecca London, “Julian is a superior TA based on his ability to (gain) his students’ trust and admiration, and is therefore able to reach them in ways that others could not”. Please join us in congratulating Julian on this great accomplishment and wishing him the best as he embarks in this professional development endeavor.